Introducing the stylish, new Mason kid's Grab-n-Go foam rocking chair with pockets that is constructed with a 100% polyurethane foam core to offer a comfy, yet sturdy place to sit. It features slightly rounded corners on the outer backrest top edges as well as flattened tops on the armrests with rounded front edges for added appeal. This new rocker is constructed with all foam, and gently rocks back and forth! 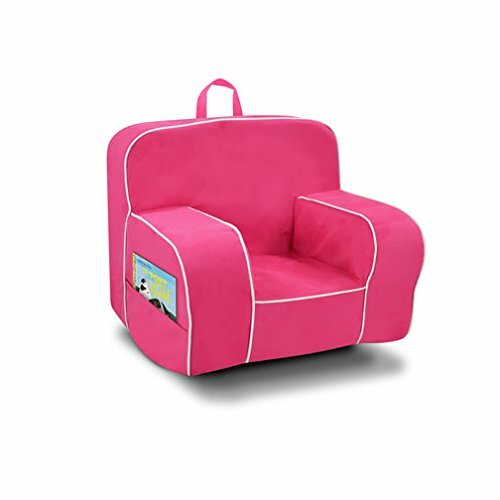 it is covered with 100% polyester microfiber in a bright, solid fuchsia, and it has a matching handle sewn into the top center of the backrest for ease in carrying from room to room. There is a white Welt cord trim surrounding the outer backrest edges, the inner and outer edges of the armrests and the seat top for added appeal. There are pockets on both outer sides of the chair that measure 15"W x 7.5"H for use in holding those books, tablets, game controls, etc. That all kids love to use! this bright pink fabric is sure to delight any young girl, and works well with many room decors. The bottom is covered with black poly/cotton upholstery fabric, and it has a zipper closure. The chair is easily cleaned by gently rubbing with a damp cloth and mild soap; air dry. or, unzip the bottom to remove the cover and hand wash with cold water and mild soap. Air dry.